Earlier this year we reported on the rapid growth of unique visitors to Boat Trader from smart phones and tablets. From January through May, increases were on the order of 150 percent a month, compared with 2011. During the summer and into the fall the number of visitors continued to rise, compared with the prior year. Boat Trader’s peak traffic month from mobile devices was July, when there were more than 700,000 unique visitors. That was not only up 119 percent from July 2011, but it also equaled the mobile visitors to the site for the first five months of 2011 combined. Total traffic to the site from all devices also peaked in July at 2.8 million, and one in four visitors was using a mobile device. 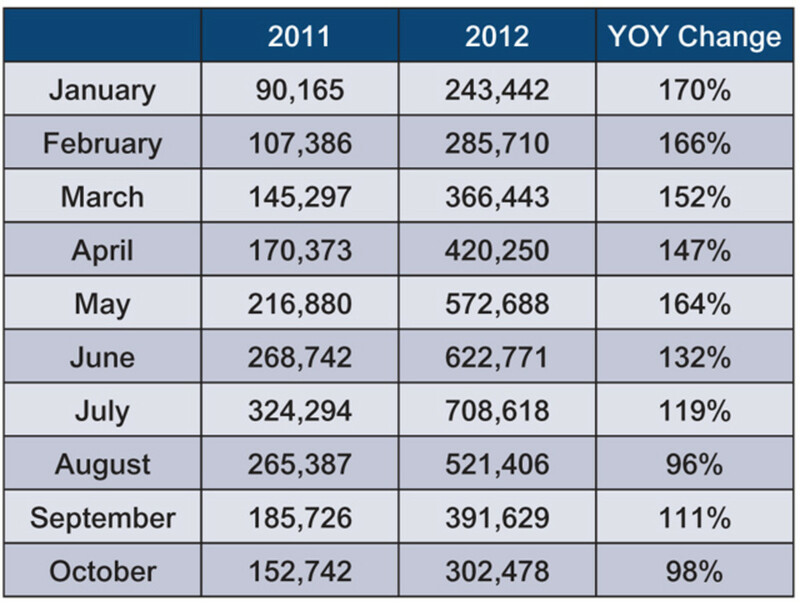 Mobile visitors have represented more than 20 percent of site traffic in every month since March of this year. Starting in August, mobile traffic declined seasonally, just as overall site traffic has declined, but on a percentage basis the traffic was still about 100 percent greater each month than the year before. That may be slower, percentagewise, than earlier in the year, but it still represents significant growth, with 150,000 to 250,000 additional unique monthly visitors looking for boats to buy on Boat Trader.